Product #21701 | SKU NC4FX-B | 0.0 (no ratings yet) Thanks for your rating! 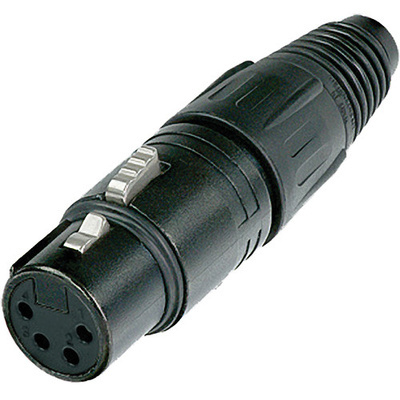 The NC4FX-B from Neutrik is a 4-pin XLR female cable connector that's regarded as an "industry standard" for quality and ease of use. The connector has only 4 parts and no screws for easy assembly. It has a rugged black zinc die cast shell and a fiberglass reinforced hard plastic insert for lasting durability. A chuck type strain relief system provides secure cable clamping, while a boot with a rubber gland gives excellent protection against bend stress. The connector has gold contacts and UL-recognized components. Colored rings and boots are available separately for easy coding and marking.